Japanese Prime Minister Shinzo Abe gestures after addressing the 72nd United Nations General Assembly at U.N. headquarters in New York, U.S., September 20, 2017. TOKYO - Japan's Prime Minister Shinzo Abe was widely expected to call a snap election Monday, hoping to capitalise on rising support as tensions with nearby North Korea reach fever pitch. Voters in the world's third-largest economy could go to the polls as soon as October 22, more than a year earlier than expected, as Abe seeks to take advantage of a political opposition in disarray. According to a weekend poll in business daily Nikkei, 44 percent of voters plan to vote for Abe's conservative LDP party, while only eight percent said they would side with the main opposition Democratic Party. Nevertheless, one fifth of those polled said they were still undecided, potentially opening the door for gains by a new party formed by allies of the popular mayor of Tokyo Yuriko Koike, which will field dozens of candidates. Koike's Tomin First no Kai (Tokyo Residents First) party humiliated Abe and the LDP in local elections in July, but analysts say the new grouping has not had time to lay national foundations to mount a serious challenge to the prime minister. "There is no opposition worthy of the name in Japan. The LDP is a giant among dwarves. 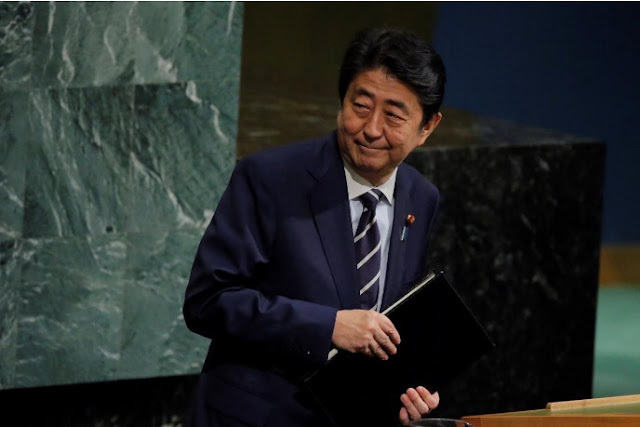 It would take a major scandal to derail the Abe express," said Jeff Kingston, Director of Asian Studies at Temple University, Japan. Pyongyang has threatened to "sink" Japan into the sea and fired two missiles over the northern island of Hokkaido in the space of less than a month. Surveys suggest voters approve of nationalist Abe's firm line on North Korea and the crisis appears to have given him a welcome boost in the polls following a series of scandals, including allegations he improperly favoured a friend in a business deal. Despite a recent run of growth, the election winner will also have to contend with a sluggish economy, as the heavily indebted country grapples with low birthrates and a shrinking labour force. Abe will reportedly announce that the proceeds from a planned sales tax hike in 2019 will be ploughed into education spending rather than paying down the country's enormous debt. Although Abe is expected to triumph in the vote, there are question marks over whether he will retain a two-thirds parliamentary majority needed to reform the constitution to strengthen Japan's military, a stated priority of his. At a time of national crisis over North Korea, Japanese voters may see it as a "cynical and opportunistic move" designed to divert attention from a series of scandals that weighed on Abe's popularity, warned Sano. Japan's Prime Minister Shinzo Abe was widely expected to call a snap election Monday, hoping to capitalise on rising support as tensions with nearby North Korea reach fever pitch.